Metallica Through the Never (Working Title: CHAOS 3D) is big. A huge production for a concert movie. 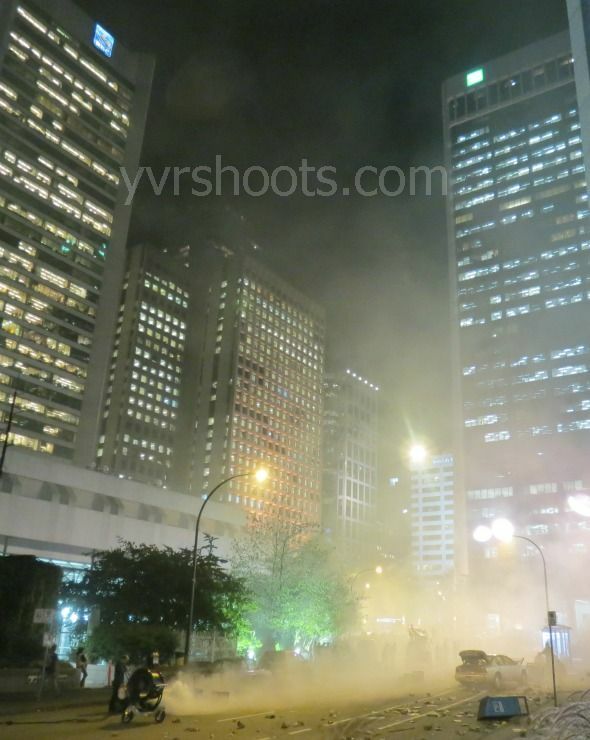 Crew made more smoke near Burrard Station in downtown Vancouver than thousands of tokers at a 4:20 rally at the Vancouver Art Gallery. And the size of their smoke machines (see below) made TV series Supernatural’s seem puny. 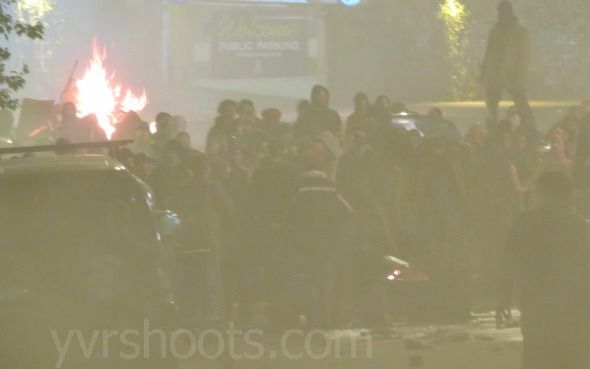 All the smoke, lights, artfully constructed debris and overturned vehicles formed a backdrop for a riot scene that will be part of Metallica’s concert movie. The heavy metal band already performed the concert part in Rogers Arena for three nights in a row. 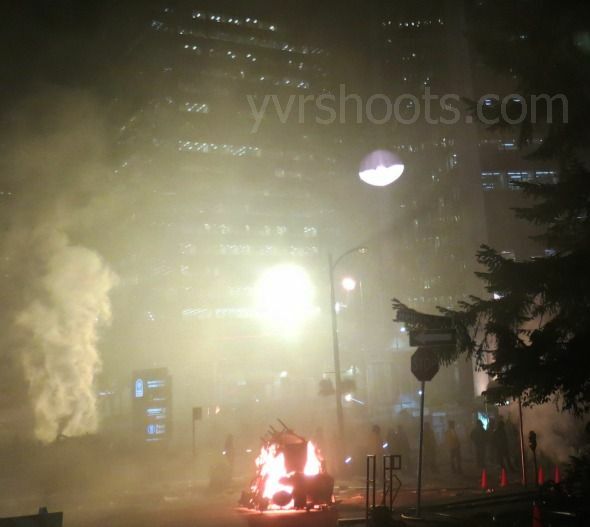 Now they’re doing the movie part all over downtown in overnight shoots in Arch Alley near Victory Square, a couple of Burrard intersections and now on Dunsmuir near the Burrard station. 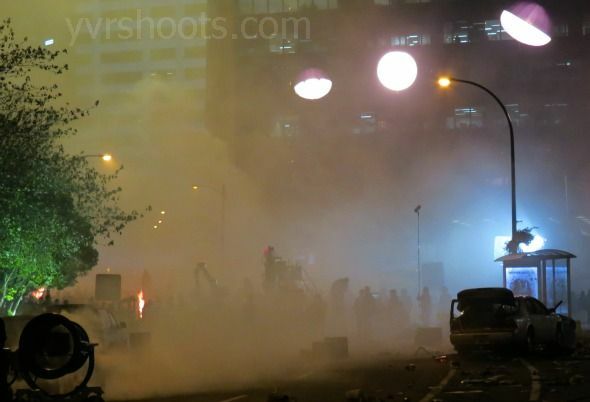 Last night’s riot had 400 extras as rioters and riot police, things on fire and riders on horses. 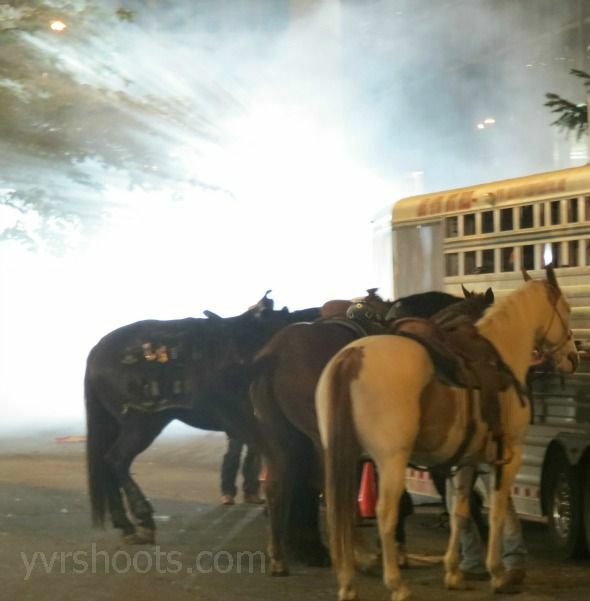 The horses — who we’ve seen on screen galloping in Golden Ears Park for Once Upon a Time — seemed a little spooked by the smoke, the noise and all the spectators. I’d hope to see a stunt of a horse dragging a rider through the scene but imagine that was filmed much later on when no one was about. The Metallica movie is expected to wrap sometime Sunday. 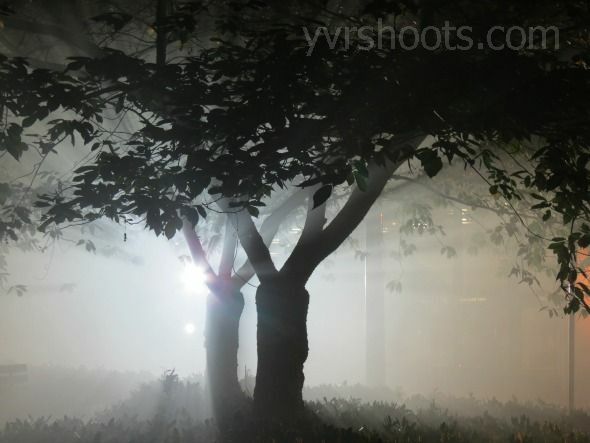 The combination of smoke and lights in the dark made an eerily beautiful image. 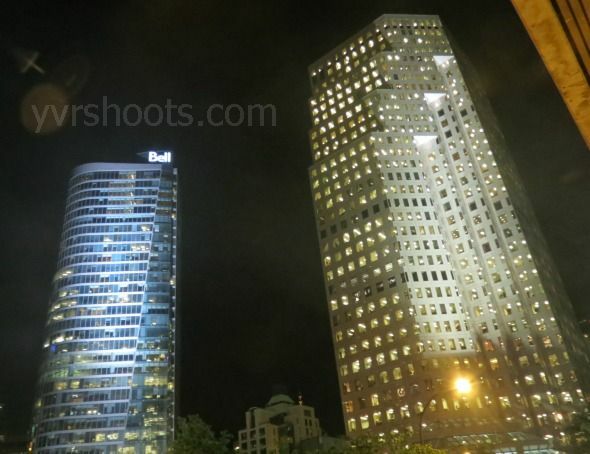 And the film lights illuminated surrounding towers like Bentall 5 and Park Plaza too. 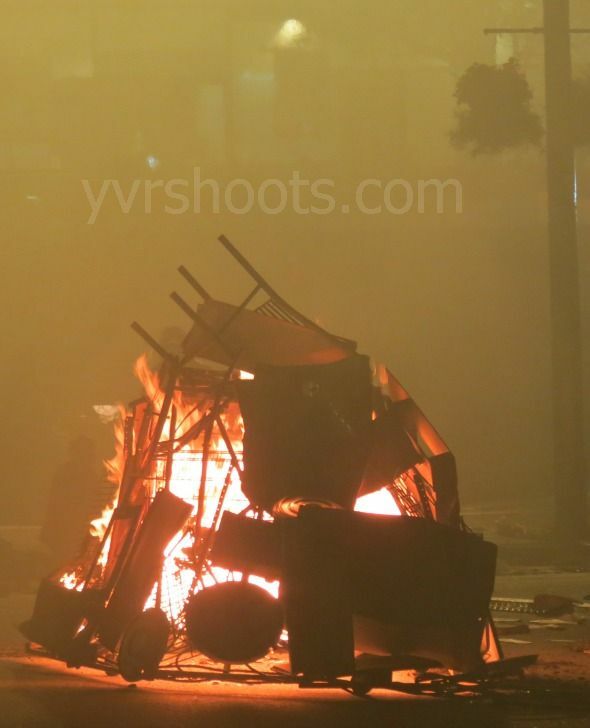 I was staying in the Hyatt in Vancouver while they were filming the riot scenes throughout the night and had a great view from my window! Amazing!! I was working on set. It was incredible the detail they had for such a shoot. So fun to work on. Absolutely amazing. ‘tallica always surprising your fans with new and different stuff. And they ever know what to do, how to do and when to do! Metallica are the biggest sell outs in history. This “movie” (are they actors now?? They have been pretending to make heavy metal since 1991) will make the Load albums looks like Master of Puppets. Cliff Burton is up there somewhere crying his eyes out. They should have just come here during the Stanley Cup Finals.